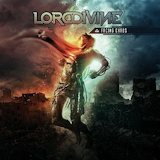 South American power metal band Lord Divine has racked up a good fifteen years of opening gigs, compilations, and other supporting roles in the scene without either calling it quits or making it big. This time they have a new vocalist to support their latest album: ex-Retrosatan's Diego Valdez, who took on vocal duties with Iron Mask on their most recent album a couple years ago. So does Facing Chaos propel them into the big time or is it more of the same? The band gives it a reasonable effort -- to the limits of their songwriting abilities. I wouldn't call this symphonic power metal, but Diego Palma's keyboards not only add the background oohs and ahhs of a symphonic atmosphere, their periodic synth riffs provide a welcome break in between midtempo guitar riffing. The guitar melodies are crammed into a narrow range with Valdez's vocals, leaving most of the instruments blasting on one note, which gets old after a few measures. After hearing these forgettable numbers, I expected the ballad-like The Beginning of the End to be worse, but it's a turn in the right direction, with a good chorus and melody and with plenty of room for the guitars to solo, a role to which they are optimally suited. In fact, though the melodies and riffing aren't particularly exciting during the meat and potatoes portions of the songs, the proggy keyboard/lead guitar duels are high points, and so are the solos, which are shred-filled delights. If the vocals sound different on The Darkest Light, that's because they are; power metal veteran Mark Boals guests on this track. Unfortunately, after these two middle tracks, we get back into the band's most comfortable territory: Boring guitar/drum blastbeat combos that can't be saved even by Valdez's decent-quality singing, punctuated by the good-quality soloing and guitar/keyboard duels. Lord Divine's latest attempt, as it turns out, is not enough to get it out of the minor leagues, mostly due to the fact that the band consists of better musicians than it does songwriters. Fans of the latest Iron Mask album might check this out, but be aware that Facing Chaos is a half-step below it in quality.